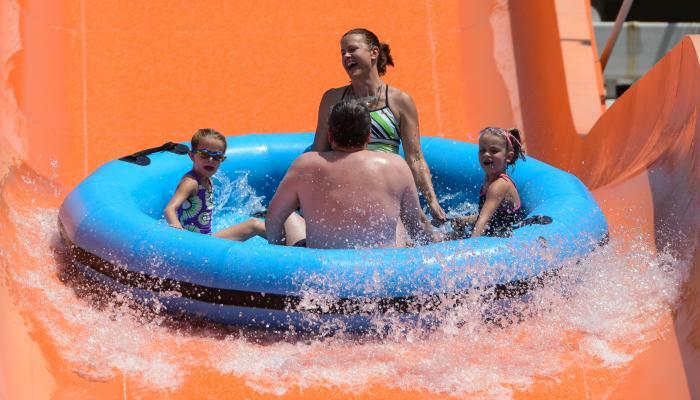 When it comes to making lifetime memories with your kids, there’s not much in these parts that competes with the electrifying adventure that is Six Flags Over Texas, a tradition for Arlington tourists and locals alike for more than 50 years. Depending on what kind of action you’re looking for, you can fly high and defy gravity on world-class thrill rides like the Galactic Attack virtual reality coaster, enjoy classic family rides like the Runaway Mine Train or El Sombrero; or spend time in the Bugs Bunny Boomtown, the park’s children’s area for tiny thrill-seekers-in-training. Regular season runs May-September; the park is open select dates for the rest of the year (including Fright Fest, Holiday in the Park and Spring Break). Get Six Flags tickets. With tickets that are only $3-$6 a pop (and children under three get in for free), The Planetarium at UT Arlington is one of the most affordable things to do in Arlington with kids—and it’s also one of the coolest. Don’t forget to stop by the Star Shop gift shop after the show, where you can get astronaut ice cream! See website for showtimes. In the mood to chill on Boogie Beach or take on a few high-velocity adventures on the Wahoo Racer? Either way, Hurricane Harbor has a little something for everyone, and a few million gallons of cool blue water to do it in. If you’re playing with younger kids, be sure and check out Hook’s Ship, featuring four small slides, shallow water and sprayers. Open May through September. Get Hurricane Harbor tickets. Get your fingers warmed up for Pac-Man, Mario Bros, Donkey Kong, Space Invaders, and tons more. Arlington’s newest arcade is so dang fun that you just might find an excuse to visit even when the kids are staying with Grandma. The concept is simple: Pay $10 a head, then, play as many games as you want for as long as you want. And they serve food, too! Vroom, vroom! Enjoy high-speed racing in first-class style at this indoor karting paradise that features top-performance electric karts and a lobby that’s part motoring museum and part arcade. K1 is suitable for all ages and experience levels. Open daily and late. Find out more about K1 Speed. If you’re looking for something different, Breakout Games is likely one of your best options. This ultra-exciting, choose-your-own-storyline gaming adventure challenges you to unravel real-time mysteries by cracking codes, solving puzzles and following clues. All ages welcome. Explore the hidden world of the critters who share our urban environment at one of the Dallas-Fort Worth area’s most unusual museum destinations. Afterwards, you can check out the wonders of River Legacy Park, a 1,300 “urban oasis” that’s home to more than 400 species of wildlife, hike and bike trails, picnic areas, and tons more. All the fun you could ask for, and it’s all under one roof. Head to Alley Cats to enjoy Putt-Putt golf, bowling, billiards, rock climbing and laser tag—and a full-service bar for Mom and Dad. Open daily and open late. Be sure and check out the KidZone page for special offers for young fun-seekers. Take a time machine back to the early days of Arlington, TX at Knapp Heritage Park, where you can explore an old schoolhouse, pioneer cabins, and a blacksmith barn—there’s even a free blacksmith presentation the last Friday of each month. Afterwards, head over to nearby Babe’s Chicken Dinner House for a family feast, or take in a show or exhibit at Theatre Arlington , Arlington Music Hall or the Arlington Museum of Art. The family fun flies sky high at Flight Deck Trampoline Park, featuring 90 wall-to-wall trampolines and special jumping events like Neon Night and Toddler Tumble, as well as plenty of “open jump” time slots where you can just come in and do your bouncy thing. Open late on weekends. With more than 80 Arlington parks and green spaces to choose from, there’s bound to be an Arlington park facility that’s just perfect for picnics, nature walks, fishing, swimming (summer only) and playground time. Worth investigating: Veterans Park (includes disc golf, equestrian trials, and wildscapes), Randol Mill Park (includes an aquatic center), Bad Konigshofen Aquatic Center, or the Southwest Nature Preserve. There’s plenty to do at Lincoln Square, where you can enjoy cheap reads and free activities for kids at Half Price Books, take in a $1 movie at the Children’s Movie Series at Studio Movie Grill [summer only], indulge in gourmet ice cream at Marble Slab Creamery or check out some pickle-flavored popcorn at The Popcorn Store. Kick it retro style with some good old-fashioned ice skating (and maybe some hot pizza or a cold drink) at Arlington Skatium, one of the largest rinks in Texas. Check the Skatium website often for theme nights, all-night skate parties, group lessons and discount skate nights. In the mood to prank your kids? Tell them you’re going to the mall to try on dress shoes, then watch those frowns turn upside down when you surprise them with a trip to the Build-A-Bear Workshop, a visit to the Cheesecake Factory, a blockbuster movie or an afternoon at the ice rink instead. No doubt about it, we&apos;re definitely blessed with an abundance of sports to play or watch in Arlington, and pretty much every venue or opportunity offers kid-friendly discounts and other experiences. Worth trying: Texas Rangers baseball (April-September), Dallas Cowboys football (August-January), UTA college athletics, Dallas Wings basketball (summer), the Arlington Tennis Center, and Arlington Golf.